Leeds University is issuing Apple iPhone 3GSs to its fourth and fifth-year medical students in a ground-breaking educational initiative. The Uni's press release heralds the message that 'Generation Y' student doctors are swapping textbooks for iPhones. As such, the Uni announces this week that the Department of Medicine is issuing iPhone 3GSs to its senior med students in order to allow them access to progress files, assessment modules and other course materials on the go. 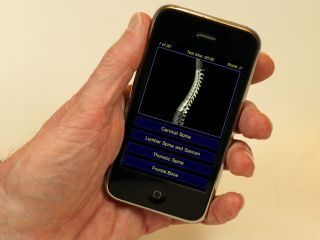 "This will be the first time that a UK medical school has provided undergraduates with all the tools they need to study off-campus via mobile phone technology," the release claims. 520 medical students will be loaned an iPhone 3GS 16GB for the remainder of their undergraduate course in Medicine at Leeds. This is because undergraduates "typically spend much of their time in local NHS hospitals, GP surgeries and community health clinics" in these final two years of their course, which makes it difficult to stay in regular contact with tutors and course materials and text books. Leeds's pioneering iPhone scheme hopes to resolve these problems, with the smartphones "pre-loaded with a range of dedicated 'apps' that will let students record notes on interesting cases whilst still on the wards, and test their knowledge of procedures or protocols they have just observed. "Copies of key medical textbooks and reference works, including up-to-date guidelines on administering prescription drugs, will also be distributed as iPhone apps. A range of other relevant medical apps that can be downloaded free-of-charge or purchased will be provided too." Students will get unlimited mobile broadband connectivity from O2 on their iPhones as part of the loan deal, with phone and text functions available to them on a pay-as-you-go basis. Professor Trudie Roberts, Professor of Medical Education at the University of Leeds added: "No other UK medical school is taking advantage of the virtual learning environment to such an extent. "It is vitally important that medical students continue to develop their skills and record their progress when they are in practice, as well as when they are on campus. "Mobile phone technology means that students can do this quickly and easily, wherever they happen to be working."